1 Hour Round The Bays cruise is a family and group friendly option. 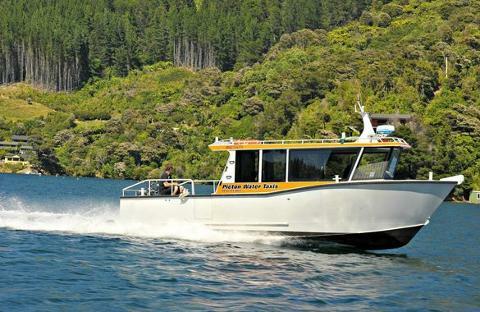 On your own private boat it takes you on a tour of discovery of the Queen Charlotte Sounds most beautiful bays. Crossing the main reach of the Queen Charlotte Sounds will have you arriving at Double Cove, a sheltered haven of holiday homes, cormorants and our famous pet fish. After having cruised around the bay taking in some amazing water front properties and wildlife nestled up in the cove, together we feed the pet fish from the boat, Herring, Mullet and Big Blue Cod are locals at feed time along with the birds that like to join in the fun. Departing Double Cove we will take you on a cruise of discovery via Onahau Bay and around the Grove Arm of the inner Queen Charlotte Sound. The cruising area is surrounded by years of regenerating beech forest. This cruise will allow you to see some of the best of the Queen Charlotte Sounds in a limited time frame. Your friendly skipper will give you a full commentary and answer any questions along the way.